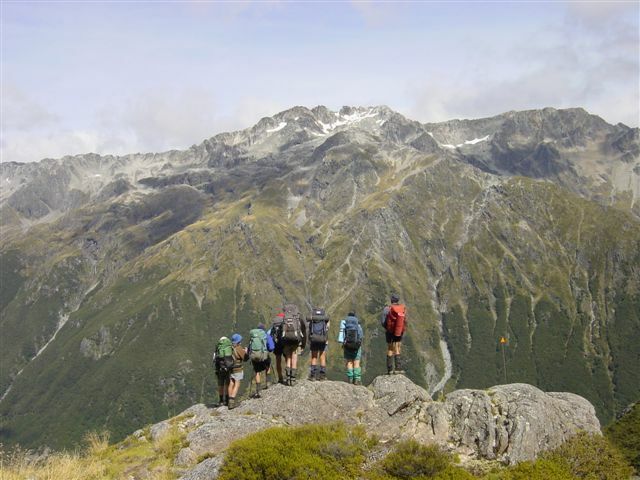 Five members of Southland Tramping Club, including trip leader Graeme Appleby, were joined by 7 North Islanders from the Whangamata TC on a foray into the Nelson Lakes National Park. Midday found the party assembled on a glorious sunny day at DOC Headquarters St Arnaurd; an interesting mix of exuberant youth and seasoned back country ‘veterans’ to complete the intention form. The team’s excitement was palatable. 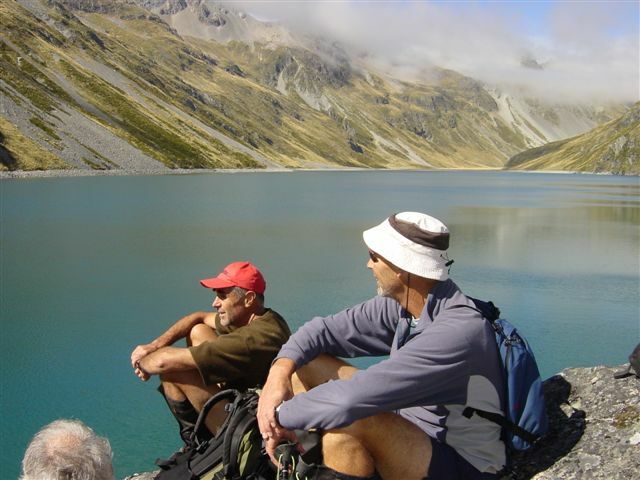 Ahead lay 7 days of adventure; alpine scenery and vegetation, 2 alpine passes, crystal clear rivers, icy cold lakes and tarns. Inter island banter flared to disguise initial shyness and fluttering nerves. A quick boat journey across beautiful Lake Rotoiti, whisked us away from civilization to the jetty at Coldwater Hut, a delightful old 6 bunker with a fireplace on the verandah. There was no lingering in this beautiful place, it was a five hour tramp to John Tait Hut and we were in no mood to become sandfly fodder. Shouldering my pack, reality kicked in. Was I really equipped to survive 7 days in an alpine bush environment? The heavy load on my back was reassuring. Equipment check lists had been distributed and discussed (over email) in the preceding months, with safety gear and group food shared amongst the team. Cooking nights had been allocated, with each pair responsible for carrying the mountain radio the day after dinner duty. 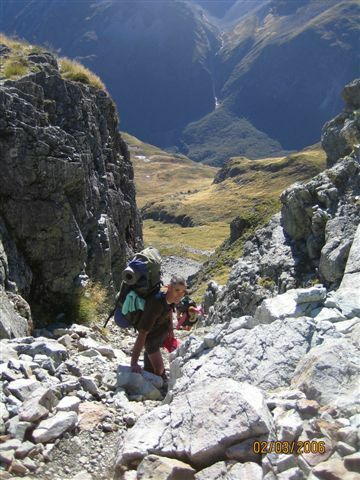 Tramping with experienced club members is a steep learning curve, but remarkably reassuring. Ignoring the weight of my pack, I allowed myself to relax and enjoy the beech track through the beech forest and grassy meadows alongside the Travers River. At 6.15 we reached John Tait Hut, located in a grassy clearing with splendid views of the mountains further up the valley. This left ample time to find a spot alongside the ‘invigorating’ Travers River for a dip-wash. If there is art to washing sweaty bodies while standing on sharp stones beside a freezing cold river on tender, just- released from- boots-feet AND avoiding sandflies, I have yet to perfect it! Fellow female trampers remember huts not so much for their glorious setting, but by the state of the dunny. Unfortunately John Tait hut goes down as the very worst we came upon. Skimpily screened from the hut by a few small beech trees, the dunny is located on the path approaching the hut. However it is not the location which made us uncomfortable, it was wasps in the loo itself. Only very necessary visits were made. The first breakfast deteriorated into a skirmish between muesli fans and the porridge eaters as the porridge took ages to cook. This good natured battle would continue every morning! John Tait to Travers is an easy day, so we took a side trip up to the Cupola Basin, 1400 m. The 8 bunk hut with windows on three sides looking out to the basin would be a magical retreat, especially for those trampers keen on alpine flowers. There was only time this trip for a quick explore of the first basin, before heading down again for lunch beside the Travers. The Travers Falls are a must see, 3 minutes off the track. The falls drop about 20metres into a deep pool surrounded by a mossy wall. A beautiful spot, where tranquility and kinetic energy coexist. From the falls the track climbs more steeply. Periodic notices issued dire ‘No Stopping, Avalanche Path’ warnings along the path. Large areas of horizontal beech forest testament to the forces of moving snow. I wasn’t keen linger, but the beautiful warm weather was taking its toll, and we were getting pretty tired. Someone called out they had spied Travers Hut. It must have been a mirage; because we did not reach this new hut until 4.00 pm. 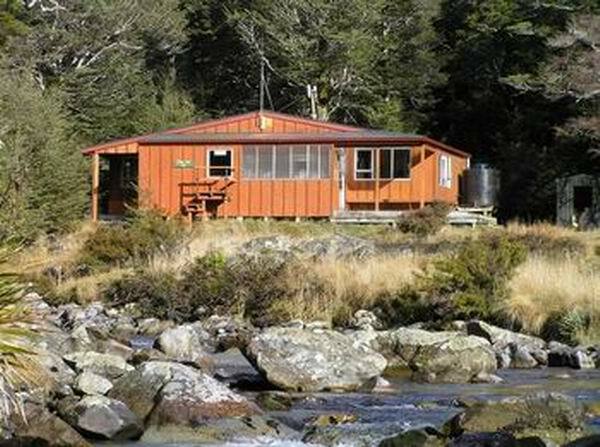 Travers Hut is beautifully located on a grassy clearing with Mt Travers looming nearby. It begs to be returned to. Graeme called a team meeting after dinner, an hilarious affair which flamed the muesli vs porridge, north vs south debate. Plans for the assault on the Travers Saddle were made and leaving time of 7.00 am set, to get the climbing out of the way before it got too hot. These casual meetings did wonders for sorting out any problems within the group. Our team was also getting to know fellow trampers on the track, and it was at Travers that we began to enjoy the company ‘the Murchison girls’. These 3 women, doing the same circuit as ourselves, exhibited a great deal of grit and wonderful humour. The porridge was cooked in double quick time on 2 cookers, and we were up in the dark in order to leave the hut by Graeme’s deadline. Even at this early hour, the ‘Murchison girls’ had a good half hour jump start on our party. The climb up to Travers Saddle (1787m), a 450m ascent from the hut didn’t seem too difficult for any of the party. Arriving at 9.00 am, most dropped packs at the top and scrambled up a nearby ridge to admire the views and shattered rock formations. Initially the descent through tussock slopes seemed easy, but then it followed a very steep scree covered gully, which was very slippery, and seemed to go on forever. I wished I had trekking poles! Once in the bush, the walking was more pleasant, but tree roots made it tricky. At one point we crossed a small bridge over a gorge. It was difficult to see the water far below, but you could certainly hear it roar! We were very pleased to reach the hut at 2.15, a good time for a long, demanding day. It was my turn to cook at Sabine. With Jan Appleby’s help, the team ate very well. The meat course is set to re-hydrating as soon as the hut is reached, as is the fruit for desert. Dehydrated vegetables cook very quickly if they have been set to soaking. There was always plenty of rice, pasta or mashed potato to go around. Despite pre tramp protests that puddings were not necessary, a small serving of pudding was served with every meal, and no one reneged! John Kennedy had hurt his back during the day, and the hut smelt very pleasantly of the herbal rub Jan used to massage his back. John wasn’t the only one to require Jan’s massage help on the trip. It had started raining and cards, sudoku or talking to fellow hut dwellers kept most entertained until bed. The porridge was cooked to perfection, but no one could find the group brown sugar. It is amazing what can be used to flavour porridge! The morning was fine after overnight rain, and several members of the group enjoyed a spot of plant identification along the way. Today’s walk was a delight, a slow climb of about 400 m, along the river, across scree slopes and several clearings made by avalanches. It took just under 4 hours. The Blue Lake is just glorious, with its vivid turquoise and emerald green colours, and I could soon see why Graeme had elected to spend 2 nights at the hut. The hut itself is only a 16 bunker, and 5 other trampers were already in the hut. In order to accommodate our party and the ‘Murchison girls,’ 9 of our group set up tent flies and slept out. The short walk left us with the afternoon to enjoy the sunshine, swim in the 9 º lake and generally rest. We made the campsite our base, were we were sheltered behind the scrubby beech and mountain toatoa. The ladies even performed their stretches outside. Mike and Sandra Morrison elected to cook and serve dinner at the campsite. After dinner Graeme divided the group into 4 teams and proceeded to run a quiz. Each team attempted to out do the others answering tramping and general knowledge questions. Graeme was compeer and judge and no one team was allowed to gain the ascendancy. Daylight disappeared as the group tried to come to terms with Wilson’s ‘Moon in the Spoon’ game. Those sleeping under fly tents had a bit of a scramble getting to bed in the dark. I was one of the groups sleeping out. It was quite an experience. Wilson and I didn’t get much sleep, or so it seemed. We kept sliding down on our sleep mats so that our feet were sticking beyond the fly! Fortunately the night was mild, but still it was freezing cold in the hour before dawn. I was wearing all my thermals inside my sleeping bag! The guys sleeping in the hut got the porridge on good and early. It helped us to warm up! Even the muesli-lovers were looking envious, but the brown sugar still hadn’t turned up! Fly tent city was dismantled and we claimed bunks in the hut as the incumbent trampers headed off. Rest day was a bit of a misnomer! Nine thirty saw everyone in the party heading up to Lake Constance with just a few carrying packs for a day trip. Half of the party headed up the valley to stand atop of the Wairau Pass. They came home tired, wind blown but exhilarated by their achievement. The other six set about exploring the amazing rocks making up the moraine damming Lake Constance and exploring the water falls feeding the Blue Lake. The weather started to change that afternoon and the cool wind whipping around making us very grateful for a bunk in the hut. The bush telegraph must have been working, because no other trampers arrived to spend the night in the hut. We set to cleaning out the hut and had soon a good fire burning. The group food and gear was all set out for redistribution prior to tackling Moss Pass, and guess what? The brown sugar turned up! I committed the sin of adding too much water to the ‘seeping’ porridge; consequently it was a bit thin. However several of the muesli lovers helped us ‘eat up’ especially since brown sugar was back on the menu! It was really cold, but nice and fine when we left the hut. 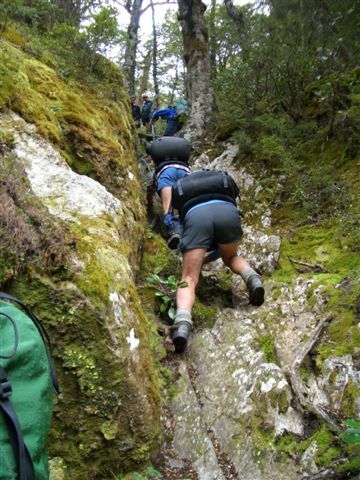 The track to Moss Pass starts climbing immediately! We were challenged but not at all daunted by the famous ‘GUT’ and were all very proud of ourselves at the top. A very chilly breeze was sufficient reminder of our ‘mere- mortal’ status and several of the group muttered that they were pleased to have reached the saddle, 1785m in excellent conditions. John Morrison was the only member of the party with enough energy to scale a ridge for even more superb views on top of the pass – oh to be in your twenty’s again! The rest of us made our way down, ever down, into the bush and beech forest. One section has a hand rope to help you down. It was tough walking, having to concentrate on every step. The sign at the swingbridge across the D’Urville, indicated 30 minutes to the George Lyon Hut (Ella Hut renamed). This last 3 km took us more like an hour. No doubt a combination of weariness on our part, and a sure striding-long-legged track measurer responsible for the DOC sign. George Lyon is an historic hut, split into 2 rooms. It is somewhat dark, but with rain setting in as we arrived, and no other trampers in residence, we didn’t mind. Apparently the hut is to retain its authenticity. Hilarious card games by candle light whiled away the last evening and we were aware of it becoming very cold outside. Day 7 Ella Hut (George Lyon) to Morgan and on to D’Urville. When it was light enough to see we discovered there was snow on the tops, and any porridge remnants were gratefully consumed by the muesli clan! With the water taxi booked for 3.30 pm, it was another early start. The walk beside the D’Urville River down to Morgan Hut was delightful, and pretty easy. There were birds about and mountain daisies in flower. We enjoyed several backward glances of the ‘sugar dusting’ clad tops, whilst checking and spying trout in the river. We stopped at the new Morgan Hut, open in 2003, to regroup. This would be a lovely hut if you are a keen trout fisherperson, or just wanted to get away. Beyond Morgan the track had us scrambling up and down river terraces which were starting to feel like mountains, and then down again. Just as we were feeling like we didn’t want to go another step, the track would cross a river flat and we made good progress. With 10 minutes signaled to D’Urville hut our spirits lifted and we enjoyed walking though a magnificent stand of remnant prodocarp forest on the delta. We reached the hut 15 minutes under the signaled 8 hours. A quick call up on the radio located in the hut reassured us the water taxi was minutes away, and we would not have to be sandfly fodder for too long. Nelson Lakes Shuttles were waiting at Rotoroa to take us back to Nelson, and while a hot shower was a huge drawcard, I found myself strangely shy of being with ‘people’ again. A big thanks to the Nelson Lakes Shuttles team, Trish, Peter and Kevin who picked up group members from all quarters and ensured we were where we were supposed to be on time. Thanks team, you were very helpful and we enjoyed your company. Incidentally, Trish, I agree with you, Travers Saddle is endless and Moss Pass, whilst challenging, was most enjoyable!